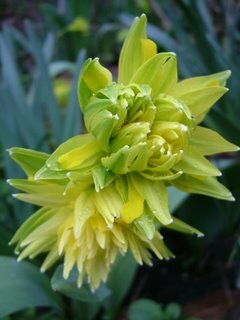 A non-food post today; we’ve had really balmy weather for a few days, and the bulbs in the garden have started to come up. It’ s got me so excited I feel compelled to show some of them to you. This gorgeous frilly bonnet of a flower is a miniature daffodil called Rip Van Winkle; I planted these in October, and they’re popping up all over the garden. Here’s a hellebore which, I sadly conclude, is the only thing that will grow under our rowan tree. I was aware of the old wives’ tale about it being a witches’ tree which prevents other plants from growing around it. I didn’t believe it, although the fuchias I put in around it last year all died – until this spring, a year into our ownership of this house, when none of the bulbs I planted under it have done anything. Not a single wood anemone, a single snowdrop, a single crocus – not a thing. And the weeds which, with the recent rain and warm weather have sprung up all over the garden, are conspicuously absent from the area around the rowan. 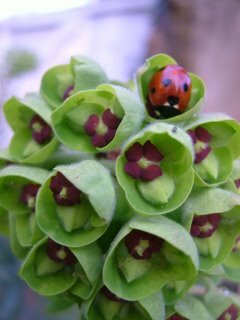 Still; at least the hellebores are doing well, and they provided a useful habitat for dozens of overwintering ladybirds. 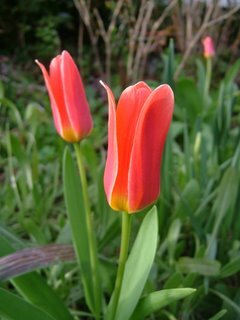 The first of the tulips are emerging. I love these straight, clean, plain ones, but I’ve also planted some really spectacular parrot tulips which haven’t come up yet; watch this space for photos when they appear. Spring is finally here in Cambridgeshire. In celebration of the fact that some of my bulbs are finally flowering, I thought I’d eat a dear little fluffy baa-lamb. This recipe is wonderful for this time of year, when the sun is bright and there’s a jug of tulips on the windowsill. The herbs and sweet tomatoes are a real foretaste of summer. Enjoy this with a cold glass of white wine, or a pint of real ale. 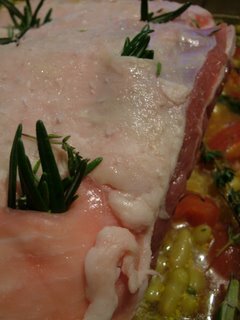 Begin by making little slits in the skin of the lamb – six to a half-shoulder will be plenty. Stuff each resulting pocket with a quarter of a clove of garlic and a sprig of rosemary. (You may want to leave the knife in the slit and twist it to fit the garlic and rosemary into the hole.) Slice the rest of the garlic finely. Sprinkle the skin of the lamb with salt. Quarter the tomatoes, and mix them with the the remaining rosemary and garlic and the rest of the ingredients in a heavy baking tray. 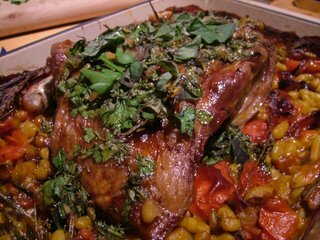 Place the lamb on top, skin side up, and roast for an hour and twenty minutes at 180°C. 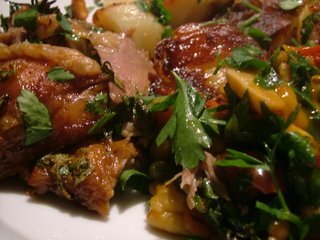 While the lamb is roasting, finely chop the parsley and oregano, and combine it half of it with two teaspoons of the quince jelly and a large pinch of salt. Remove the lamb from the oven and smear the herb paste all over the skin. Stir the other two teaspoons of quince jelly and the rest of the herbs into the beans around the lamb, and return to the oven for ten minutes, until glossy and beautiful. 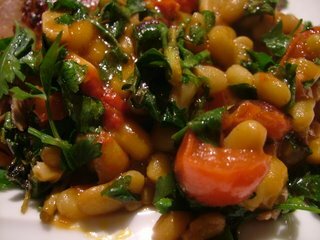 The beans will have soaked up the juices from the tomatoes and meat, becoming sticky, rich and packed with flavour. You should be left with some meat for tomorrow’s sandwiches – the beans are also delicious cold. 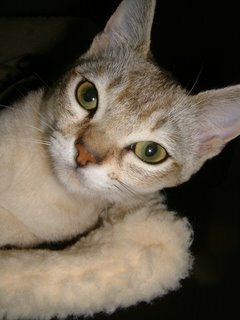 I’ve had a few emails asking how the cats are doing post-neutering. They’re fine, and have been bombing around the house completely unaffected; I suppose this is what comes of not having a pelvic floor. As you can see, they’re still very kittenish and tiny. 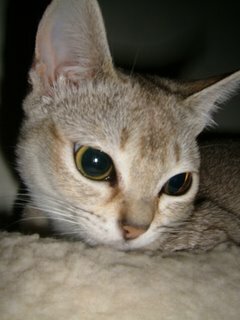 Unfortunately, they have discovered a liking for the Sheba chicken domes I gave them as a sort of edible apology for whipping their gonads out and are now demanding them nightly; how is it that cats are able to work out which the most expensive food is with such unerring accuracy? 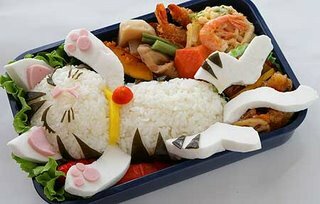 I found this fabulous rice, pickle, fish ball and nori kitten at E-Obento, a Japanese site full of beautiful, edible art. It’s in Japanese, but the navigation is pretty easy to follow – check it out! Wandering through Sainsbury’s this evening, I saw a shelf full of fresh garlic. I spent a whole five seconds or so wondering how they’d managed to get hold of fresh garlic in March, and then (I’m being slow today) thought to read the label. It’s from Egypt. Now, usually, I wouldn’t buy an overpriced, overpackaged single bulb that had flown such a long way to get to me . . . but as I continued my shopping, my mind kept going back to the garlic. After being slightly snappish with the lady at the fish counter about the pathetic lack of shellfish, I finally left self-control at the vegetable counter and bought a single bulb. Here it is, the thick outer skin peeled off. 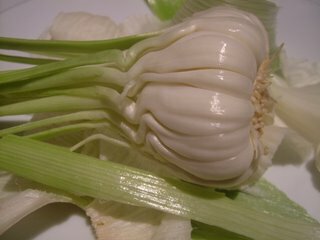 You can see each individual clove in place; the green tendrils growing in a point from each become the white, straw-like threads you’ll recognise on the cloves of ordinary, cured garlic you have in your kitchen cupboard. When green, these tendrils are edible and very tasty; imagine a garlicky spring onion. This year, I’m growing a lot of garlic for eating fresh in the garden; it’s sweeter, more fragrant and less harsh than the dry product. (I’m planning to have a go at curing my own this year if I manage to raise enough in the garden.) This fresh garlic roasts to a sweet, delectable paste, perfect spread on sourdough bread or stirred into a sauce. 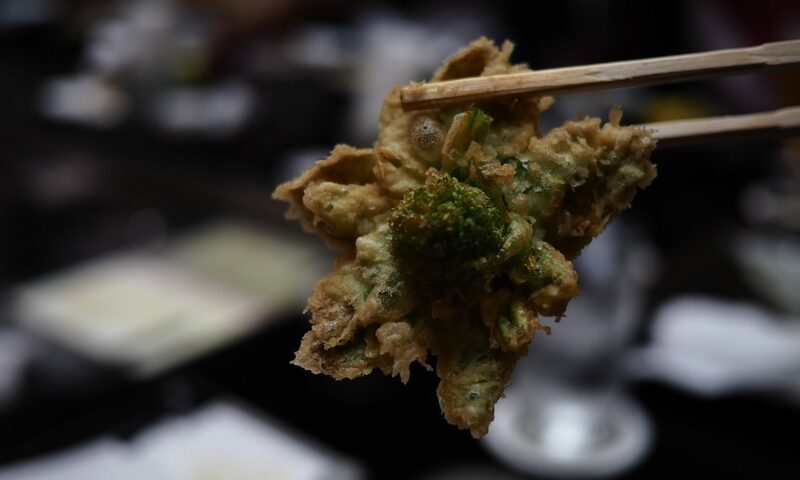 It is mild enough to be eaten raw. Sauteed gently, as in this recipe, it is juicy, plump and delicious. 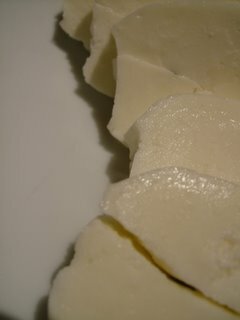 Halloumi is a salty, mild-tasting, ewes’-milk cheese from the Middle East. It has a very special quality; it holds its shape and does not melt in cooking, instead turning crisply golden outside and tender inside. The Lebanese call it the kebab cheese, and it’s excellent on a skewer over a barbecue. Melt the butter in a thick pan, and gently fry the whole cloves of garlic (green parts still attached) and the shallots for about ten minutes until golden. 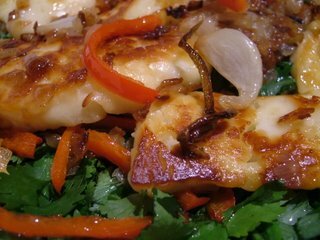 Slide the halloumi into the pan and fry on one side for five minutes until golden. Add the chili, cut into strips, turn the cheese over and wait until the second side is golden too. Layer half the cheese, shallots, garlic and chilis in a large mixing bowl, then sprinkle herbs on top. Arrange the rest of the halloumi and the pan juices over the herbs. Squeeze the juice of a lemon all over the salad and serve with crusty bread and some sliced tomatoes. I’m 30 today. Mr Weasel assures me that I am still a very large kid with a bank account, which is an interpretation I like. My brother, similarly encouraging, has suggested that you are only as old as you act, and that as long as I don’t clean the kitchen properly and continue to leave my pants on the floor, he will keep not writing my age in my birthday card. 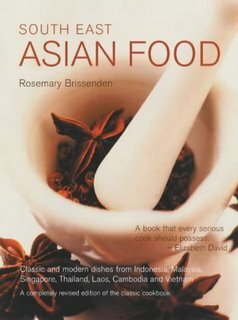 Among my presents was (thank you Mummy and Daddy – thank you also for the fantastic framed set of 1934 cigarette cards featuring Hollywood starlets) a copy of Rosemary Brissenden’s South East Asian Food, which is a positive bible of authentic South East Asian cuisine. It has chapters on Indonesia, Malaysia, Singapore, Thailand, Laos, Cambodia and Vietnam, and I’m poring through it, delighted to find recipes for things which I never, ever thought I’d be able to cook at home. These are recipes which are seldom written down, but passed through families orally. I finally have a recipe for that Laotian paper beef which I had in a restaurant in Paris a few years ago; a proper recipe for the sambal for Nasi Lemak, a way to make Banh Xeo at home and detailed instructions on exactly what I should be doing with a green papaya. I’m not cooking today (I am being taken out secretly by Mr Weasel this evening and am writing this in a hasty lunch hour) – watch this space for Banh Xeo from my new book. It’s brilliant. A great present – thanks again. Would the person from Chelmsford who came here via a Google search for “husband ordered to wear starched apron” please explain why? 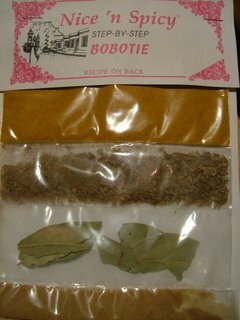 We were visiting some South African friends a few evenings ago, and were sent home, late and pleasantly hazy (at least on my part; Mr Weasel had to drive), with a packet of spices for making bobotie. This is serendipity; I’d already planned on making bobotie this weekend, as it had popped into my head the minute the same friends had invited us over. 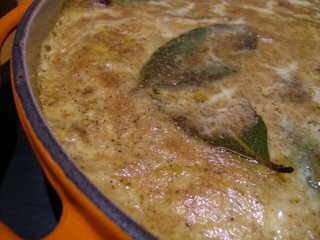 This bobotie, though, turned out even better than my old recipe, thanks in part to a slightly different method as described on the back of the spices, and also to the Cape Malay curry powder that was included in the pack of spices. This curry powder is very different in character from the Bolst’s I usually use. It’s approximately Madras-hot, but it’s much heavier on the fenugreek than Indian curry powders often are. If any readers know where I can find some in the UK, I’d be delighted to hear from you. 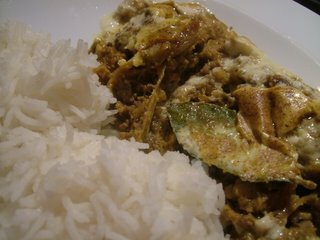 I first came across bobotie when I was a little girl. I remember asking Mummy what we were having for tea that evening. ‘Mince and custard,’ she replied. I wasn’t terribly happy about the concept, but it was, in fact, delicious. I would recommend that you don’t introduce the creamy topping on the spiced meat to your family as ‘custard’. Although it is, strictly speaking, a custard made with milk and eggs but no sugar, your squeamish children will not thank you for pointing this out. Call it a delicious creamy sauce or something. Soak the bread in half the milk, then give it a good squeeze, retaining the excess milk. Crumble the bread and mix it with the beef and the curry powder. Leave to one side while you fry the onion so the flavour of the curry powder can penetrate the meat. 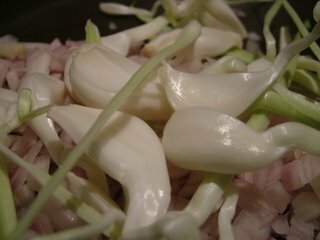 Melt the butter and use it to fry the onion, sliced finely, with the ginger, garlic, cumin and coriander until golden. Remove the onion and spices to a bowl, retaining the butter, and fry the meat, curry powder and bread mixture in the butter until the meat is cooked. Put in a bowl with the onion mixture, one egg, the lemon juice, salt, half of the remaining milk, the sultanas and the chutney. Mix thoroughly. Press the mixture into a greased baking dish. Beat the remaining milk with an egg, and pour it over the top of the mixture. Press the bay leaves into the top (in South Africa you might use lemon leaves) then sprinkle with the Garam Masala. Bake at 180°C for 35 minutes, until the top is set and golden. Serve with rice and a salad. I’ve been experiencing some real difficulty with Blogger over the last few days; I’ve been unable to post photos today, and for the last couple of days I’ve been unable to get the new post dialogue to work at all (at least that seems to be working OK again now). I’ve a couple of posts ready to put up, but for the moment they’re without photos – please be assured that they’ll be in place just as soon as the thing starts working again! A comment the other day complained that English potatoes are sweet and powdery things, not worth cooking with. I beg to differ; six months of living and cooking in Paris convinced me that the English potato is a glorious beast, not bettered anywhere in the world. No American or Asian potato has yet made me think otherwise. Halve the potatoes and drop them into boiling water for eight minutes. Drain and transfer to a baking tray. Quarter the onions and separate each quarter into layers. 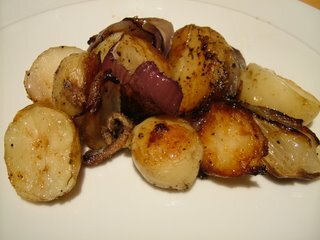 Mix the potatoes, onions, anchovies, salt, pepper and fat well and put in an oven at 180°C for 45 minutes, or until everything is golden and fragrant.